Image courtesy of the Philadelphia Rock Gyms. 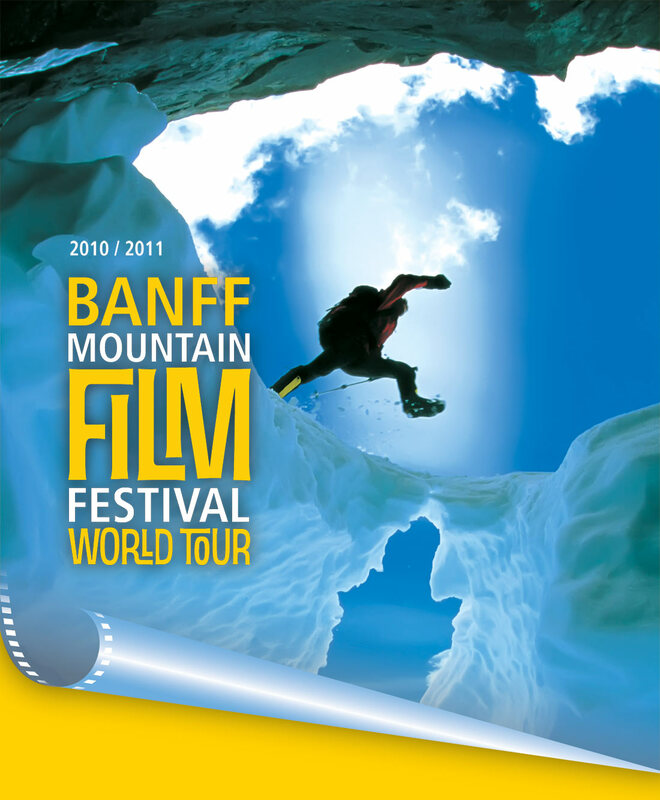 This year, I took my wonderful mother and brother to the Banff Mountain Film Festival World Tour. The past two years, I've attended with friends and reveled in the fact that I'm in an auditorium filled with my people - outdoors people. But this year, Mom was in town and it seemed a perfect way to spend an evening as a family. This would have been true had one of the films not featured a guy my age who threw himself over a 186-foot waterfall in a whitewater kayak after telling his mother he was just out for a paddle! The Banff Mountain Film Festival flicks and road warrior spent two nights in Malvern, Pennsylvania for the 16th year, thanks to the Philadelphia Rock Gyms. The World Tour gives viewers all across the country a chance to see award winning, inspirational, informative, and beautiful outdoor films. Friday night's showing brought laughter, tears, and plenty of "omigod how do they DO that?!" gasps. I wish they'd stayed in Malvern for the entire day and shown all 28 films that made the tour this year. But alas, I only saw six of them, and would love to hear what others who went to showings in their towns got to see! I cried during and after this film. It's 51 minutes of atrocities, heartbreaks and how those who survived both managed to do so. In 2006, Chinese border patrol guards opened fire on a group of Tibetan refugees making a pilgrimage to India over the Nangpa Pass. A young nun was killed. Director Mark Gould tells the story through witness interviews, including mountain guides and one daring filmmaker in various camps on Cho Oyu at the time. Luis Benitez, reputable Himalayan mountain guide, was the first to break the story after returning from a higher camp on Cho Oyu to find no one had said a word to the outside world. Luis and filmmaker Sergiu Matei, who released footage he secretly filmed of the incident, risked their lives in hostile territory to make sure the story was heard. In a region where ties with China determine whether or not guiding outfits get permits to climb, others were reluctant to say anything about what they'd seen. Of course, the most difficult part was listening to refugee accounts of their lives before the choice to flee and surviving the attack. Their voices were so full of hope, but laced with a sadness I could hardly bear. Read more about the film. This four minute flick got more laughs out of the crowd than any other four minutes of the festival did. It's tough to tell if it's supposed to be a parody, or if it's really a film about bada$$ elementary school aged boys "borrowing" a truck, going for a joyride, and taking on beautiful mountain biking trails I would think twice about riding. Though it's supposed to be silly, it's tough not to notice how talented the kids are! Watch a clip of the film. This, my friends, is a 38-minute film about fishing. Yes, fishing. And it won the "Best Film on Mountain Sports" award at the Banff Mountain Film Festival. Somehow, director Ben Knight managed not only to keep me interested and laughing the entire film, he directed my favorite film of the evening. The film takes us on a journey to the Kamchatka Peninsula through unexplored rivers deep in the eastern part of Russia only accessible by decommissioned Cold War era helicopters. We're shown a passion for fishing in pristine places and the sarcasm that comes with being eaten alive by giant mosquitoes for weeks on end. Bigfoot makes a few appearances as well! More about the film. Vimeo Clip. This film profiles Ueli Steck, possibly the greatest speed climber ever. He regales us with tales of speed ascents in the Alps, shows us what climbing The Nose on El Cap two days in a row in the time it would take most of us to climb three pitches looks like, and takes us on two record breaking speed ascents of the Eiger. The footage in the film is absolutely breathtaking, including of Ueli taking a 75-foot whipper on El Cap. Though I have to say, this is one film I wish my mother hadn't seen! More about the film. Shot with a special camera system, this film is definitely more artistic than adrenaline-filled. It's certainly not a typical extreme skiing film, which was refreshing. I found it beautiful, but forgettable. More about the film. This is another one I wish my mother hadn't seen! A passionate group of whitewater kayakers set afloat on rivers in both North and South America to find the biggest waterfalls they can. Their ultimate goal is to see just how far the human body can be pushed. The limit they find is Palouse Falls in Washington. At 186 feet, it's still the tallest waterfall kayaked, and the fall took Tyler Bradt 3.7 seconds. Kayaking looks like a good time, but this is an entirely new level. More about the film. I've missed the Banff film festival when it comes to Denver. I did see another film fest where I got to see Uli Stecks video. Completely amazing! That guy is a machine! Isn't he unbelievable? I was floored by what he's able to do. What gets me more than anything is how he's able to maintain his composure. Just incredible! We went the second night (at the PRG showing). I wrote a quick post on one of the films (the one that was about big wall climbing). Nice review on the 6 we didn't see. I wish I could've gone to both nights! maybe next year. I always end up missing some films I'd love to see.